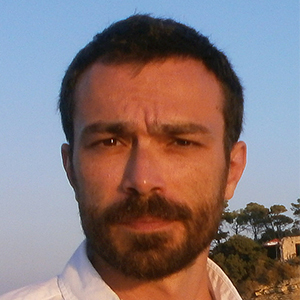 Edoardo Sotgiu is currently Staff Researcher in the group of Microfabrication and Exploratory Nanotechnology at the INL, and he focuses his research in the field of Haptics. He received a M.Sc. in Mechanical Engineering from the University of Pisa in 2003, and he joined the PERCRO laboratory of the Scuola Superiore Sant’Anna in 2004. He worked there as Research Fellow until March 2017. He has been involved on many European (PRESENCE,SKILLS,DECISION-IN-MOTION,CENTAURO,WEARHAP) and Italian (RIME,DOC,RONDA) research projects about several different topics like control of parallel kinematics haptic interfaces, bilateral teleoperation system for surgery, autonomous mobile robot based on bioinspired vision, vibrotactile and sensorized device for perception study, exoskeletal robotic device and virtual reality application for rehabilitation therapy. His research interests regarded also the biomechanics and human movement analysis, control of exoskeleton robotic devices, robot-assisted neurorehabilitation and pedestrian navigation system for blind people. Sarac, M.; Solazzi, M.; Sotgiu, E.; Bergamasco, M.; Frisoli, A. Design and kinematic optimization of a novel underactuated robotic hand exoskeleton. Meccanica. Advances in Biomechanics: from foundations to applications. pp. 1-13, 2016. Barsotti, M.; Leonardis, D.; Loconsole, C.; Solazzi, M.; Sotgiu, E.; Procopio, C.; Chisari, C.; Bergamasco, M.; Frisoli, A. A full upper limb robotic exoskeleton for reaching and grasping rehabilitation triggered by MI-BCI. IEEE International Conference on Rehabilitation Robotics (ICORR), 2015. Frisoli, A.; Sotgiu, E.; Procopio, C.; Bergamasco, M.; Chisari, C.; Lamola, G.; Rossi, B. Training and assessment of upper limb motor function with a robotic exoskeleton after stroke. Arrighi, P.; Sotgiu, E.; Borelli, L.; Crecchi, A.; Bonfiglio, L.; Carboncini, M.C. ; Cantore, N.; Rossi, B.; Frisoli, A.; Andre, P.
EEG correlates of action awareness in the parietal cortex. Frisoli A.; Sotgiu E.; Avizzano C.A. ; Checcacci D.; Bergamasco M.
Force-based impedance control of a haptic master system for teleoperation.